A planted tank is more inviting. Plants can help make an aquarium healthier and more stable. They produce oxygen, absorb carbon dioxide and break down waste to improve the environment for your fish. But you can have too many plants in a tank and thereby create a breeding ground for fungi. Fungi are in all aquariums, whether freshwater or saltwater, but you will find that aquariums that have an abundance of fish and live plants have more. Fungi are natural decomposers, breaking down organic matter, so the more organic matter in the tank, the more likely fungi will flourish. If you have an aquarium with a lot of plants and fish, you want to make sure to regularly clean the water and tank decorations. Black fungus will grow if you do not clean your tank water properly. It is attracted to higher levels of salt in the water, so when you do not clean, test and treat your water, it will start to spread throughout the aquarium. Black fungus is not necessarily harmful on your aquarium plants, but if it continues to flourish, the fungus can kill your plants and continue to spread. If you notice black fungus growth in your aquarium, clean and treat your water, scrub the glass and clean off all decorations in your tank. If the fungus continues to grow, treat the water with a salt-reducing chemical. White fungus is more dangerous than black fungus, so if you notice white fungal growth, remove infected plants immediately. You will also want to remove any fungal growth on decorations and/or gravel. This fungus can be harmful to your aquarium plants and fatal to your fish -- it spreads quickly through the membranes of the fish. You may notice white cottonlike growth on your fish, as well as the waste on the bottom of the aquarium. Algae are not typical fungi, but they are not considered plant or animals, so many classify algae as fungi. All aquariums contain algae; in small quantities, algae can be beneficial for your aquarium, but you do not want an abundance. In large quantities, algae will compete with your water plants and starve them of valuable nutrients and lighting. 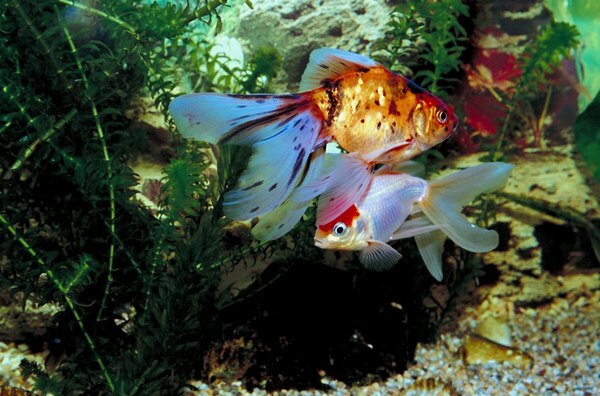 When cleaning your aquarium, scrub the walls and decor to remove excess algae growth. You may even want to add an algae-eating fish to help keep the growth to a minimum. The Complete Guide to Tropical Aquarium Fish Care; D. Alterton: 1998.